Oakland County Waterparks 2019 Info – Red Oaks Waterpark Madison Hts MI admission prices, hours. Waterford Oaks Waterpark admission prices, hours, and info for 2019. Red Oaks Waterpark Opening Day is Friday, June 7, 2019. Free Events with Paid Admission — Shark Day at the Waterpark includes activities from 11a-3p, including shark cootie catchers, photo booth, shark toss game, water gun tie-dye towel (while supplies last) and nature table. FREE rides on the Zip Line. Must be between 45 & 250 lbs and wear closed toe shoes and sign a waiver. Free Events with Paid Admission — Pirate Day includes activities from 11a to 3p. Come dressed as a pirate — best dressed receives a prize. Activities include a pirate craft, nature activity, water gun tie-dye towel (while supplies last), tattoo parlor and diving in the wave pool to find a golden coin. Free Events with Paid Admission — Wookie Wednesday includes activities from 11a-3p. Come dressed as your favorite galactic character — best dressed receives a prize. Activities include a pool noodle light saber craft, nature activity, water gun tie-dye T-shirt (participants need to bring their own light-colored T-shirt) and nerf gun target practice. 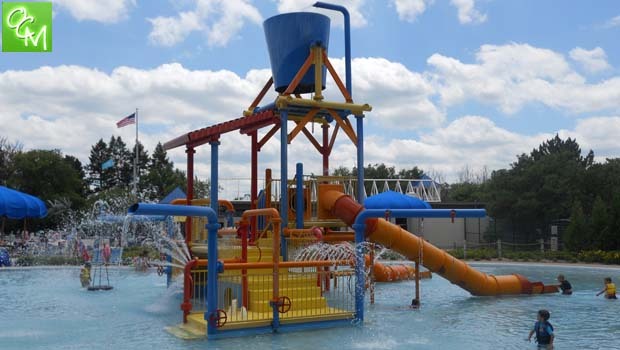 Red Oaks Waterpark 2019 Admission Prices – Admission is $20, Oakland County Resident Discount rate is $14, Seniors/Active Military get a $2 discount off of admission. Weekday rates – Adults $17, Oakland County Resident Discount is $11, Seniors/Active Military/Adaptive patrons get a $2 discount off of admission (excludes twilight & discounted rates). twilight special of $14 non-res and $8 resident off is also available after 4p on weekdays (non-holidays). Oakland County Waterparks 2019 Red Oaks Waterpark Season Passes Info – $99 (non-resident) and $75 (resident). Purchase season passes online. Note – Rates for the season pass, and individual entry fees, have been decreased for the 2019 season due to the fact Ragin’ Rapids, group raft ride, will be removed before the waterpark opens. The 22-year-old attraction has reached the end of its lifecycle. Waterford Oaks Waterpark 2019 Admission Prices – Admission is $13, Oakland County Resident Discount rate is $10, Seniors/Active Military get a $1 discount off of admission. Weekday rates are – Adults $8. Twilight rates are buy one/get one free. Buy One, Get One Free Weekday Admission – After 4p Monday-Friday only, excluding holidays – second admission of equal or lesser value. Oakland County Waterparks 2019 Waterford Oaks Waterpark Season Passes Info – $55 (non-resident) and $45 (resident). Purchase season passes online. Waterford Oaks Waterpark 2019 Admission Prices Early Season Discount – From now until May 24, 2019 you can buy an unlimited season pass to Waterford Oaks Waterpark and for $40 (resident) or $49 non-Oakland County resident. Visit OaklandCountyParks.com to purchase. Shelters for parties, social gatherings and more are available at Red Oaks Waterpark and Waterford Oaks Waterpark. Contact www.OaklandCountyParks.com for more info.